Today I'm flying. All the way from one side of the continent to the other, and as always it will take from about 7am - when I walk out the door at Sock Summit International World Headquarters (that's Tina's house) until about 11pm, when I'll walk in the door at home. I find it trying, and I struggle to understand why humanity isn't working harder on teleportation and feel sure that if we just make the people responsible for looking into it do the Portland-Vancouver-Toronto trip with the right degree of frequency, then they would begin to feel a certain sense of urgency with the work. 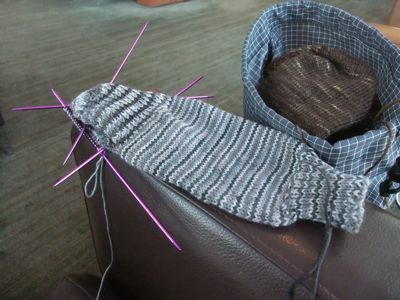 I'm hoping to finish the second sock of one pair and the first of a second and maybe even start a third, which would put me merely very far behind schedule instead of ridiculously far behind schedule, which is where I am now. The flight is five hours, so its not going to happen, but I have to believe it is. 3. No, I don't have special needles or wooden ones or only circulars or anything like that. Most of the time they are my signature needles (the green ones above) but they are almost always metal. 4. Nope. I don't do anything special to get them by security. 6. Yup. Always fine. All North America, all fine, all the time, every flight, never had them taken away. They are allowed. It is fine. It is not a problem. 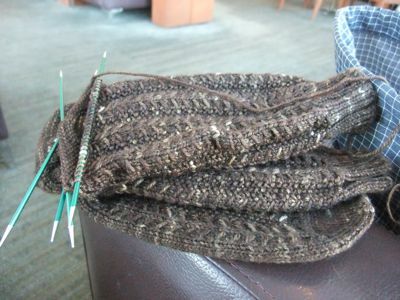 Nobody at security has ever said anything at all about the needles, with the exception of "What are you making?" Which is because it is fine. My technique is to put them in my bag, and then go through security like everyone else. If I am getting specially screened and they ask me if there is anything sharp in my bag, I say "I have knitting needles, so mind those don't poke you". They say "Thanks" This is because it is allowed. Which I suppose technically means that you may have problems if you've brought acrylic or cotton yarn, which makes me think that I really got away with something earlier this year when I flew with needles, but only in the presence of silk. I knit on planes, I don't do anything special to do that, and I'm going to do it today. A lot.